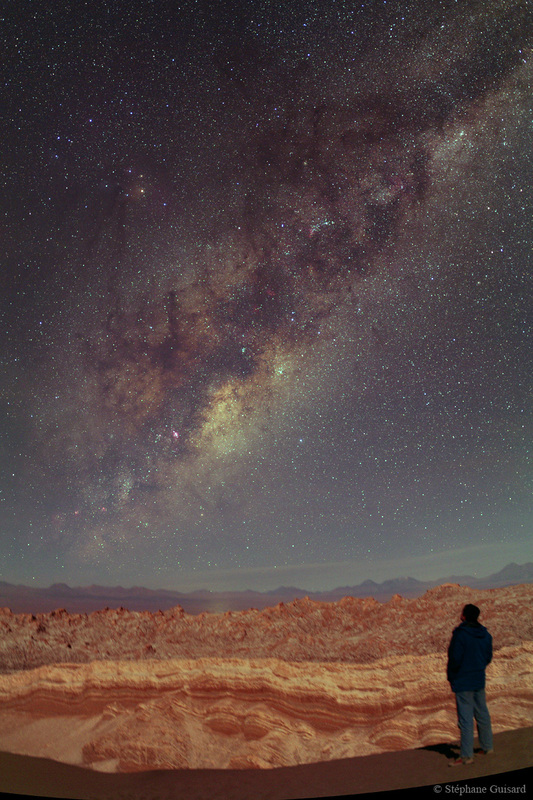 The Milky Way is rising majestically above the Chilean Atacama Andes in the San Pedro de Atacama region. Most of the peaks visible in the landscape background have altitudes above 5000m and even 6000m for some of them. Nearly in the middle of the image are the Chajnantor mountain (5639 m) and plateau (5300 m) where the ALMA radio telescope project is being built. Note that is image is a one-shot image (in fact a mosaique made of 3 one-shot images), there is no background/foreground composition made here, or composition of pictures made with different exposure times etc ... instead, the author choose the date and time at which the picture was taken in order to have the landscape and observer lit up correctly by the natural moon light. The camera was mounted on an equatorial mount to track the stars, explaining why the landscape and observer are slightly blurred.